Right now, there are some people in Japan who appear to be doing their best to kill off tattoos. This guy is one of many who wants to stop that. For the past two years plus, I’ve been working on a tattoo book called Japanese Tattoos: History * Culture * Design. It’s about the symbols and motifs found in irezumi, which is one of the Japanese words for tattoos. The designs are complex and fascinating and encompass so much of the country’s visual tradition as well as its culture. But some of the artists I’ve interviewed and whose work the book features have either been picked up by the police, had their studios closed, or have left the country. Much of the recent tattoo crackdown appears to be concentrated in Osaka, where the prefectural government has increasingly become antagonistic towards tattoos. Its waves are being felt in the tattoo community across the country. Tattooing was legalized in Japan after World War II. Prior to that, it had been banned in the late 19th century as the country tried to modernize and shed cultural trappings that it either thought Westerners would find primitive or ones it had long hoped to eradicate. During the prohibition, tattoo was driven completely underground. However, during the past few decades, tattooing became increasingly open when compared to how things were in the past. Now, there is a wide variety of shops and tattooers, catering to a wide array of tastes, styles, and clients. You can get classic designs or fun, poppy creations. These days, it’s really your choice. In 2001, however, the Ministry of Health, Labour and Welfare instituted a directive, stating that only licensed health care providers could pierce the skin with a needle and insert ink. It was up to the authorities in each prefecture to enforce this. Originally, the directive wasn’t to go after tattooers, but permanent makeup (cosmetic tattooing) after various incidents and problems that were happening at that time. And this didn’t impact tattooers until recently, because certain authorities are now applying the Medical Practitioner’s Law to them in earnest. This past April, Osaka’s biggest tattoo convention was suddenly canceled a week before it was to be held. Some after, several tattoo studios in Osaka were apparently raided, and in August NHK reported, five tattooers were arrested for “tattooing 11 people without a physician’s license.” Yes, it actually said that. The tattooers were arrested because they were not doctors. Those don’t appear to be isolated arrests as last month, Nikkan Sports reported that two more tattooers were arrested in Nagoya for violating the Medical Practitioner’s Law. In 21st century Japan, tattooers getting arrested like this is unprecedented. It’s all rather baffling, to be honest. First, tattooers in Japan obviously come from a completely different tradition from those performing cosmetic tattooing. The training is different, the designs are different, and the purpose is different. Then, tattoos are not a medical procedure. They’re an artform or a craft. Just as tattooers could not do doctor’s jobs, doctors could not do tattooers jobs, and for authorities to imply such seems to show a gross misunderstanding of both professions. The government hasn’t made things easier for tattooers—or their clients, for that matter. Japan doesn’t regulate the tattoo industry, which it really should, and doesn’t issues certification or licenses, which it also should. Things do need to change. The Asahi News, one of Japan’s biggest newspapers, reported how one 27-year-old Osaka tattooer who goes by Taiki was picked up for allegedly violating the Medical Practitioner’s Law. 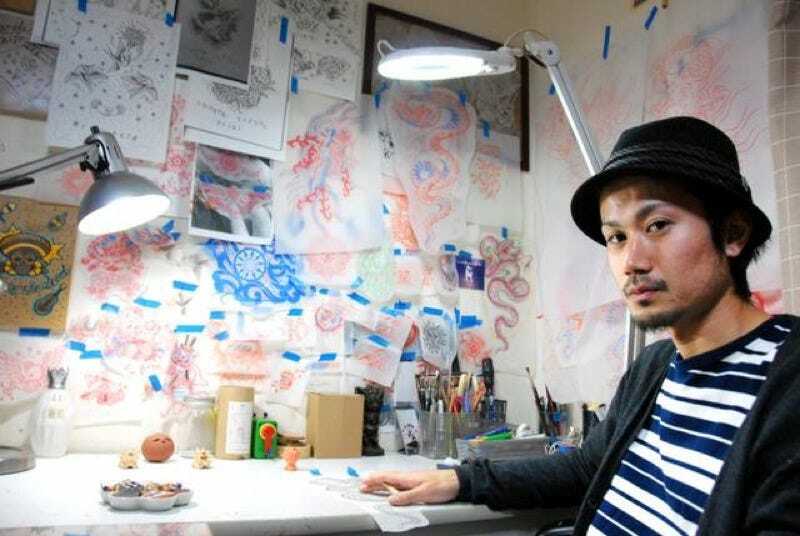 Asahi reports how Taiki works in a clean, hygienic environment, how he doesn’t tattoo yakuza, and how most of his clients get tattoos to express their sense of style. These days, this is not uncommon. Instead of paying his 300,000 yen (US$2,445) fine, Taiki is taking this fight into the Japanese courts, posing the question as to whether or not his job is a crime. The month, procedures begin for a public trial. Taiki has created a Facebook page called Saving Tattooing in Japan, hoping to garner support for this cause. If this goes to trial and if the courts rule that, yes, Taiki broke the law, this would be a landmark case. In turn, all tattooers in Japan would be breaking the law. There would be no ambiguity about the profession. The gray area would be gone. I don’t think it would erase tattoos from Japan. The form has previously survived a prohibition and a World War, so it would continue to exist in some manner. But I do think that such a ruling would cause many of the country’s best tattooers to go abroad and drive the ones who stay further underground. The resulting environment would become far less safe for clients. It’s the worst case scenario, really. Often when you talk to tattooers in Japan, they like to point out how in the past, kabuki wasn’t held in the same high esteem that it is today. The country has elevated kabuki to a venerated Japanese art. Its actors appear in commercials and are national treasures. Kabuki is respected. The hope is that the same will happen for tattoos. The article originally appeared on December 9, 2015. Update - June 3, 2016: Late last month, Save Tattooing in Japan collected 23,513 signatures on a petition to submit to the National Diet in Tokyo. Apparently, it’s necessary to collect at least ten thousand signatures to get the Japanese Diet to respond to the petition, and this one more than doubled that. That means Japanese leaders will have to address this issue, as the case continues to make its way through the courts. Save Tattooing in Japan also has a Change.org petition for English-speaking supporters. The goal is to collect a total of 100,000 signatures by year’s end.